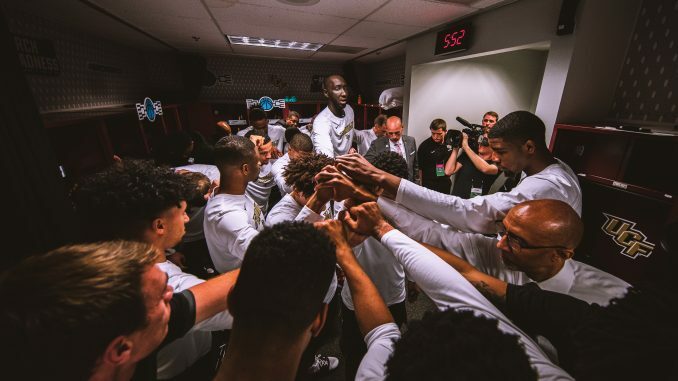 The UCF men’s basketball team came one play away from upsetting No. 1 overall seed Duke Sunday evening, falling 77-76 to end its NCAA Tournament run. The No. 9 seed Knights (24-9, 13-5 AAC) hung with the Blue Devils (31-5, 14-4 ACC) from the opening tipoff. The two teams went back and forth in the first half, with UCF leading by as many as six. Redshirt junior guard Aubrey Dawkins led the way for UCF in the first 20 minutes, scoring 18 points. He was three-of-four from beyond the three-point line, keeping pace with a Duke squad that was five-for-11 from three. With under four minutes left in the half, UCF led 34-32. From there, Duke took over. A combination of swarming press defense and hot shooting allowed the Blue Devils to end the half on a 12-2 run. Duke got 15 first-half points from freshman phenom Zion Williamson and 11 from fellow freshman RJ Barrett. Freshman Cam Reddish also had 10 before the break. Despite trailing by eight heading into the locker room, the Knights were even with the Blue Devils in the rebounding department. However, the issue was UCF’s eight turnovers to Duke’s four. Senior center Tacko Fall was also a major difference-maker. When he was on the court for UCF, the team had a plus-one point differential. With him on the bench, it was minus-nine. The second half started with a quick 7-0 run for UCF, with more hot shooting from Dawkins and contributions in the paint from Fall. Just over two minutes into the second half, the Knights trailed 44-43. They continued to hang in throughout the second half, with Dawkins and Fall leading the way. Redshirt senior guard BJ Taylor struggled to get going for much of the game, but his first field goal of the game – a three around the 10-minute mark – gave UCF a 57-54 lead. Williamson answered back with a three of his own, setting up a tense final 10 minutes. Seconds later, Fall picked up his fourth foul and headed to the bench. The Blue Devils then got hot from beyond the arc, finding some separation for a 66-59 lead. However, UCF refused to go away, with Dawkins staying hot. He scored five straight to get the Knights within two. Williamson kept going, but UCF continued to answer. A three from redshirt senior guard Dayon Griffin brought the game to 68-67 with 5:09 to go. A three from Taylor at the four-minute mark gave the Knights a 70-68 lead – their first since there was 10:24 left. After a timeout, Duke tied the game at 70. A quick 4-0 run gave UCF the lead and a lot of momentum, but another three from Reddish cut the deficit to one. UCF held a late three-point lead, but Williamson drove in for a layup and was fouled with 14.4 seconds left, setting up a potential game-tying free throw. The foul was Fall’s fifth, ending his night. Williamson missed his free throw, but an offensive rebound by Barrett led to the go-ahead bucket for Duke with 11 seconds left. On the game’s last possession, Taylor drove in and put up a shot that bounced off the rim. Dawkins nearly tipped in the game-winner, but it barely dropped off the rim. With the miss, Duke hung on for the victory. Dawkins finished the night with 32 points, matching Williamson for the game-high. Fall put up 15 points, and Taylor came up with 15 of his own. For Duke, Barrett finished with 16, while Reddish added 13. With the season-ending loss, the Knights finish their historic year with an overall record of 24-9. Duke improved to 31-5, advancing to the Sweet 16.